Eight people have been invited to an island estate for the weekend. One of them is a werewolf. Can you guess which one? 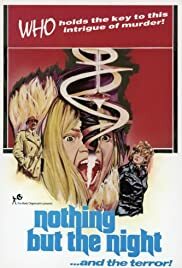 A young woman recovering from a nervous breakdown moves with her husband to a boys' school, and finds herself being terrorized by a mysterious one-armed man, but nobody believes her. This nightmare has already killed five people - now it's yours to live! Christopher Lee's own production company Charlemagne Productions survived for just one film - this one - it is no wonder why. Stifled by a convoluted plot and a haphazardly written script, the viewer is continually left confused by various events which are put together in an alarmingly thoughtless fashion. Even Christopher Lee and Peter Cushing look unsettled by what is going on around them. It is far from easy viewing and the end doesn't come quick enough. This could easily be voted as the worst of the horror duo's collaborations!